Medieval illustration of tabula players from the 13th century Carmina Burana. 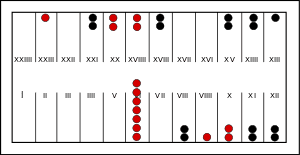 Tabula (Byzantine Greek: τάβλη), meaning a plank or board, was a Greco-Roman board game, and is generally thought to be the direct ancestor of modern backgammon. A game of τάβλη (tabula) played by Byzantine emperor Zeno in 480 AD and recorded by Agathias in circa 530 AD because of a very unlucky dice throw for Zeno (red), as he threw 2, 5 and 6 and was forced to leave eight pieces alone and thus prone to capture. See "Zeno's Game of τάβλη" by Roland G. Austin. According to the Etymologiae by Isidore of Seville, tabula was first invented by a Greek soldier of the Trojan War named Alea. The earliest description of "τάβλη" (tavli) is in an epigram of Byzantine emperor Zeno (r. 474-475; 476-491), given by Agathias of Myrine (6th century AD), who describes a game in which Zeno goes from a strong position to a very weak one after an unfortunate dice roll. The rules of Tabula were reconstructed in the 19th century by Becq de Fouquières based upon this epigram. The game was played on a board nearly identical to a modern backgammon board with 24 points, 12 on each side. Two players had 15 pieces each, and moved them in opposing directions around the board, according to the roll of three dice. A piece resting alone in a space on the board was vulnerable to being hit. Hitting a blot, reentering a piece from the bar, and bearing off, all had the same rules as today. The only differences with modern backgammon were the use of an extra die (three rather than two) and the starting of all pieces off the board (with them entering in the same way that pieces on the bar enter in modern backgammon). In the epigram Zeno, who was white (red in illustration), had a stack of seven checkers, three stacks of two checkers and two blots, checkers that stand alone on a point and are therefore in danger of being put outside the board by an incoming opponent checker. Zeno threw the three dice with which the game was played and obtained 2, 5 and 6. As in backgammon, Zeno could not move to a space occupied by two opponent (black) pieces. The white and black checkers were so distributed on the points that the only way to use all of the three results, as required by the game rules, was to break the three stacks of two checkers into blots, thus exposing them to capture and ruining the game for Zeno. Tabula was most likely a later refinement of ludus duodecim scriptorum, with the board's middle row of points removed, and only the two outer rows remaining. Today, the word "τάβλη" is still used to refer to backgammon in Greece, as well as in Turkey (as tavla) and in Romania (as table); in these countries, backgammon remains a popular game played in town squares and in cafes.